La politica es la politica: A gringo Pope for Mexico? Though it was billed as “important”, it was the sort of press conference that the Mexican journalist Andrés Beltramo of Notimex expected to be “very tedious”. That’s because it was a meeting of the cardinals of the Catholic Church – hardly expected to be a barn-burner. Beltramo was there because he was expecting the canonization of a Mexican woman, Lupita Zavala. But it turned out to be when Pope Benedict XVI (Joseph Ratzinger) announced his resignation – the first Pope to do so in 600 years. The Italian journalist Giovanna Chirri was the first to figure out what was going on, as he understood Latin. The only other journalists present were from France and Japan. The only thing unusual was that Benedict XVI’s speech was broadcast on closed circuit video. Then, at the end of the meeting, the Pope began to read from a second piece of paper, and announced that he was resigning due to health reasons – a big shock also given that it came in the middle of Lent, and that the Pope was gearing up for a visit to Brazil in June. The Pope will officially step down at 20:00 hours on February 28. Immediately after the Pope’s February 28 resignation, the Church’s cardinals will be summoned to Rome to elect the next pontiff, who must be under 80 years old. The election will be held in private in the Sistine Chapel in Rome. If there is agreement, a white plume of smoke is sent above the Vatican. If not, the plume is black. The Canadian Marc Ouellet, 68, is considered among the top three candidates (yes, kids, Canadians are gringos, even French Canadians). 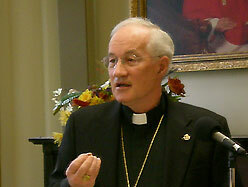 Ouellet is president of the Pontifical Commission for Latin America, as well as prefect of the powerful Congregation for Bishops. He is on the record as saying that being Pope would be a “nightmare”, but in this business a little humility tilts the odds. Other top contenders are Angelo Scola, Archbishop of Milan, and Christoph Schoenborn, Archbishop of Vienna. The Cardinal of New York, Timothy Dolan, is also a possibility, but less likely. He is a popular conservative, but there is some resistance to having a pontiff from the world’s most powerful country. Latin America is well represented among candidates: there is Joao Braz de Aviz, 65, from Brazil; Leonardo Sandri, 69, from Argentina; and Odilo Pedro Scherer, 63, also from Brazil. However, these three are not considered front runners. That said, Mexico might do well to have a “social justice” Pope with an understanding of Latin America – the most dangerous place in the world to be a priest – particularly given the risks they face every day. Interestingly, the leading candidate is from Ghana, Africa. He is Peter Turkson, 64, a conservative with strong views on global financial reform and also, controversially, the risk to Christianity presented by radical Islam.